Pierre Sabatier, was born in Moulins, France, in 1925. where he spends his early years. After the war, he moves to Paris, and, from 1949 to 1952, he studies at the Ecole Superieure des Arts Decoratifs, and the Ecole Nationale des Beaux Arts, where he enlists in fresco painting. A great admirer of Egyptian and Assyrian art, as well as of the architecture of the great cathedrals, he is interested in exploring the different approaches and techniques available to painters and sculptors to integrate their work into an architectural environment. He is especially fascinated and inspired by the work of Le Corbusier. In 1966, the publication of a new magazine “Le Mur Vivant” - with introductory texts by Raymond Lopez, Maurice Novarina, and Le Corbusier - is hailed as an important event by artists of his generation who had been campaigning for the integration of art and architecture. Sabatier joins this movement with which he feels much kinship. Thanks to a 1% for art program – first implemented for educational buildings in 1951 - Sabatier is selected to create his first truly monumental commissions. His early important mosaic murals, inside and outside public buildings, are the impressive ceramic wall for the Lycee de France in Romorantin in 1966, and that for the stadium at the Porte d”Orleans in Paris in 1968. During the 70’s, he will eventually abandon this technique to concentrate on working with what will become his favorite material: a variety of metals. During these years, well-known architects commission him to create works for interior spaces in a series of buildings in the complex of Paris La Defense. In 1967, for the architects Luc and Xavier Arsene-Henry, he designs and creates a monumental composition in hammered and oxidized copper for the central space of the Tour Aquitaine at La Defense. This gives him an opportunity to develop an “acid fresco” technique which will become one of his specialties. Another important example of this particular technique can be seen in a commission for the lobby of La Royale Belge, an insurance company in Brussels, in 1969. Pierre Sabatier creates site-specific art-in-architecture projects for private corporations such as banks, and insurance companies, and for public facilities: schools, universities, city halls, courthouses. Some of these are abroad: in Belgium, Germany, Canada, Saudi Arabia, Irak, Cameroun, and Gabon. During the 60’s Pierre Sabatier sets up a large studio in his native region in order to work on many projects with a team that will number up to 10 assistants, whom he will train personally. Among them, Jean-Pierre Colly and Michel Mazouz, his “faithful companions” who worked with him during 35 years. In 1968, Sabatier is invited with other artists – including Ubac and Manessier – to create a site-specific commission for the new City Hall in Grenoble (Architect: Maurice Novarina). For this project, he chooses a new mode of expression and creates a “claustra” or screen, from cut-out brass with lead, which art critic Pierre Cabane praises for its originality. He will use a similar format and technique for the Fondation Goldmintz in Anvers in 1970, and “Les Portes de l’au-dela” for the cemetery of Joncherolles in Villetaneuse in 1975. During these years, Pierre Sabatier’s creations are usually functional: walls, doors, screens, and are totally integrated within the architectural environment. He takes into consideration all the surfaces and the scale of the surrounding spaces. His projects will logically move into the creation of total environments within which he will integrate functional elements. 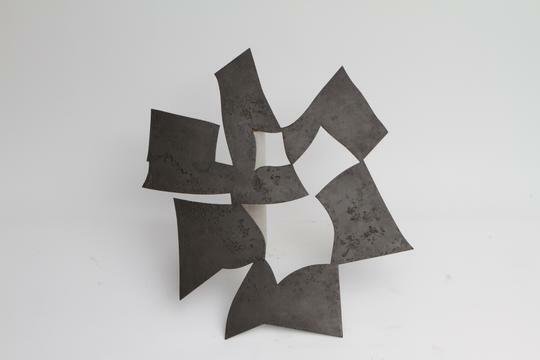 An example is a sculptural space in steel and tin created for the Ecole Nationale Superieure d’Electricite d’Orsay, in 1977, and also his patio for the Institut Universitaire de Technologie de Calais in 1986. In 1974, Pierre Sabatier is awarded the commission for the façade of the new headquarters of the Societe Parfums Rochas (33, rue Francois 1er in Paris). This installation made of PVC pipes, originally meant to be temporary, will remain in situ for ten years and is now considered a symbol of the style of the 70’s. During the 80’s Sabatier starts experimenting with different techniques in concrete, which he uses in playgrounds. During his whole life Pierre Sabatier never ceased to search for and experiment with different techniques and modes of expressions. In 1981 he conceives The Kaleicycloscope – an architectural environment in aluminum composed of moving cylindrical parts with rotating images. From 1995 to 2001, he creates La Siderolithe – a sculpture as a living space made of tubes of steel, and integrated within a designed natural environment. 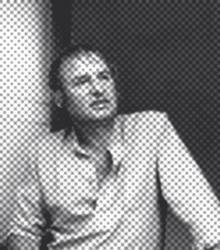 Pierre Sabatier died in Paris in 2003, having accomplished a remarquable body of work within contemporary architecture in France and abroad. His more than 150 creations are impressive because of their monumentality and variety. He received the bronze medal for the “Arts Plastiques de l’Academie d’Architecture” in 1974, and the silver medal in 1976. He was awarded the Legion of Honor in 2002. Besides his monumental art-in-architecture projects, Pierre Sabatier has also created an impressive body of liturgical works of art and furniture .